Britain's nuclear-armed submarines would be "more than welcome" in Wales if they left Scotland, First Minister Carwyn Jones has said. The SNP government in Edinburgh wants the fleet removed from its base on the west coast of Scotland. At question time in the Senedd, Mr Jones suggested the nuclear deterrent could come to Pembrokeshire if forced to look for a home elsewhere. 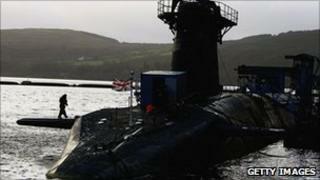 But the UK government said it had no plans to move from HM Naval Base Clyde. This week it awarded a £1.1bn contract for reactor cores. Britain has four Royal Navy Vanguard submarines, based at the Faslane naval base on the Clyde, which can deploy Trident ballistic missiles carrying nuclear warheads. Mr Jones, who will be in Scotland for a meeting of British and Irish ministers on Friday, was asked about the potential to invest in Welsh ports. He said: "I did notice the Scottish government no longer wishes to have the nuclear submarine base at Faslane, it no longer wishes to house the UK naval nuclear fleet. "There will be more than a welcome for that fleet and those jobs in Milford Haven." Milford Haven is a natural deep water port that handles around a fifth of the UK's energy through oil and gas imports. At the weekend the Scottish government said it was "firmly committed to the earliest possible withdrawal of Trident from Scotland". It said independence is the only constitutional option that would give it the power to remove Trident from Scottish waters. The Welsh government later said Mr Jones's comments had nothing to do with the SNP's referendum on Scottish independence and that he was a "staunch supporter" of the union. A spokesman said: "The first minister recognises the substantial economic benefits of relocating Britain's nuclear submarine to west Wales. "There would be more than a welcome in Wales for this kind of economic boost, which would bring thousands of high quality, well paid jobs to the area. "The first minister is of the view that he would be neglecting his duty to do what he can to boost the Welsh economy he were to dismiss the possibility of bringing these jobs to Wales." There was an angry response to his suggestion from Plaid Cymru politicians and activists. Writing on Twitter, Plaid AM Jonathan Edwards said: "This is a hugely significant development. "Milford is a huge energy portal. LPG (liquefied petroleum gas) and nukes don't go together." The UK government insists a final decision on replacing the Trident nuclear deterrent will not be taken until 2016 - after the next general election. The Ministry of Defence says the £1.1bn reactor core contract announced recently secures 300 jobs at Rolls-Royce and will fund an 11-year refurbishment of its plant at Raynesway in Derby. In response to Mr Jones's suggestion to move the nuclear submarines to Wales, an MoD spokesperson said: "The government is clear that Scotland benefits from being part of the UK and the UK benefits from having Scotland within it. "No plans for independence are being made as the government is confident that people in Scotland will continue to support the UK in any referendum. "We are therefore not making plans to move the nuclear deterrent from HM Naval Base Clyde. "The government is committed to maintaining a continuous submarine-based nuclear deterrent and has begun the work of replacing our existing submarines."